After work tonight (I was off at 9:15pm) I actually felt like working out. I didn’t feel all super pumped this’ll-be-the-best-workout-ever! but I felt, I dunno, like it was time. Like I had hit my fed upness with myself, hit my limit of lazy and wanted to do something physical. I had to stop at Superstore on my way home but I decided on the drive to Superstore that once I got home I’d quickly change and go for a run. I was actually looking forward to it believe it or not. Well, after Superstore I get back in the suv and start driving and got hit by a wave of tiredness. Completely out of proportion to the level of activity I had for the day I might add. I swear I felt like I could have gone home, gone to bed and fallen asleep right away. I never sleep early, my body just can’t do it, so feeling like that was uber weird for me. I got home, sat in the suv and tried to mentally convince myself that I was going to go for a run, even if it was slow, even if it was pathetic, at least it would be something. 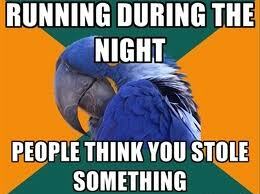 I was texting with a couple friends at the time and one of them said I shouldn’t go running, it was too late at night and not safe. I was all “huh? that’s ridiculous” but it got me thinking. I’ve gone for runs at night before and while running have thought it was high on the list of stupid decisions I have made because it is dark, late, paths are empty, not only could I injure myself due to poor lighting conditions but I could come across someone who has less-than-nice intentions and get myself in to some serious trouble. I’d be an idiot to not be aware of that. I absolutely hate the idea of fear making a decision for me, of my not doing something because it could be dangerous, could put me in an unsafe situation, could have negative consequences. People would never get anywhere, have new experiences, truly enjoy life to it’s fullest if fear made their decisions for them. For all of that though, I have to be realistic. There are certain situations I really don’t want to be in, like being attacked while running, and if running late at night is going to increase my chance of that well, maybe I shouldn’t go. sigh. Despite living in a city that is considered safe, in an area that I feel comfortable walking home tipsy in, I still have to be aware of my surroundings, keep an eye out for someone acting suspiciously, someone who perhaps doesn’t belong or might have nefarious reasons for being there. And isn’t that pathetic, and sad, and horrible? That as a woman I can’t go running late at night without having a niggling fear it could be dangerous, without having to be aware that it is my responsibility to not put myself in a stupid situation because others can’t be trusted? How did this come to be? Or better yet, how can we stop it being like this?